July | 2014 | And Baby B Makes Three! We’ve got some good friends in St. Louis, who I actually met on my parenting board, but we’ve met up several times now and I would consider her and her family to be close friends. Our oldest kids are pretty close in age, and there’s more of a gap between our second kids’ ages, but they still love hanging out with each other. 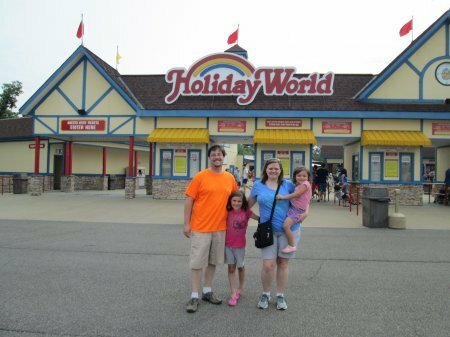 Back in the spring, I made an offhand comment on FB that we should meet up at Holiday World amusement park in Santa Claus, Indiana, as it’s fairly close to halfway between us. She said, “We really should do this!” and planning took off from there. We took off Friday and drove up after lunch, arriving at the Lake Rudolph Campground right after check-in time. We had rented a cabin there that could fit all eight of us, and we’d do campground stuff on Friday, Holiday World on Saturday, and keep things flexible for Sunday. Our friends arrived about half an hour after us, and we got settled in the cabin (that had a cool loft area for the kids! ), then all of the girls went swimming while the boys went off to do boy adventure things (that included finding the game room and obtaining firewood). It was pretty warm out, so the cool water felt refreshing. We went back to the cabin but realized we were locked out because we only had one key and the boys (who had the key) weren’t back yet. Oops! It wasn’t a big deal, really, except it meant we had to go to one of the bathhouses for a potty break, and we got started making dinner much later than intended. We did burgers and hot dogs, corn, chips, and baked beans — quite the camping feast! After that, we made a fire in the ring and made s’mores and chatted while the kids basically went back and forth, in and out of the cabin. All of the children went to bed waaaaay too late (like 11 p.m.), but hey, vacation, right? On Saturday we got up early, got ready, and drove next door to Holiday World. It was the first time going there for all of us, but I’d heard it was a great place for young kids, and that proved to be true. We did little-kid rides, we did a couple bigger coasters, and we did some mild rides. Oh, and we also hit the water park for a few hours in the middle of the day. The Girls did such a good job with waiting in lines, especially considering it was pretty hot outside. Oh, and I suspected The Little Sis would like amusement park rides as much as The Big Sis, and I was right about that! We didn’t leave the park until right before closing time (9:30), so we basically opened and closed the park, which made for a long day, but I would consider it a successful one. Of course, that meant that our intended dinner of spaghetti at the cabin was even later than our cookout dinner the night before, but, hey, vacation, right? The Husbands were very nice and told us to stay out of the kitchen and they’d finish preparing dinner (I’d already made the sauce at home), which was much appreciated. More s’mores followed, and a super-late bedtime followed for the kids (about 11:30 p.m….eek. And The Little Sis didn’t have a nap…but she was a rockstar and did amazing!). 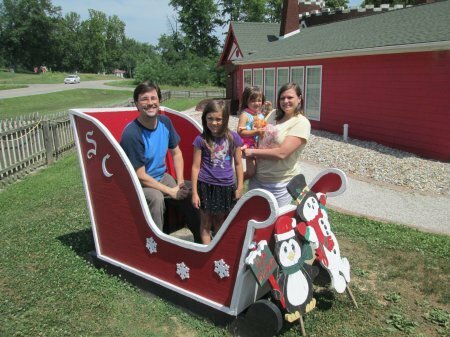 On Sunday, we woke up to very hot and humid conditions outside, so we bagged any true outdoor activities at the campground and went to Santa’s Candy Castle with our friends, then went to the Santa Claus Christmas Store on our own before hitting the road. At the Christmas store, they had a Santa area set up in the back. Now, The Little Sis hasn’t ever liked Santa, and when you go to the mall Santa at Christmas, there’s not time for Santa to build trust with a wary kid, but there was almost no one in the store, and no one else waiting to see Santa, so he had time to try to coax The Little Sis into coming closer to him, which he did a very good job with. So we actually ended up with some pictures of her with Santa. And, The Big Sis made sure to add their names to Santa’s Nice List while we were there. All in all, it was a great trip that I think we’d all like to do again. We didn’t get to do even a fraction of what was available at the campground — fishing, crafts, mini-golf, ice cream, hiking, and more! Combine great activities with even greater friends and you have a recipe for an awesome getaway weekend. We switched The Little Sis’s crib to a toddler bed several weeks ago, but we still had a futon in her room (in couch position, which is where we’d read bedtime stories), and that’s where The Little Sis was choosing to sleep probably 95% of the time. We finally decided to move the futon to a bed position (mostly so we could more easily put a mattress protector on there), and it occurred to me that I should probably start floating the idea of getting rid of the crib, just in case it took her a while to warm up to the idea. Years ago, I knew The Big Sis wouldn’t have an issue getting rid of the crib when it was her turn, but The Little Sis can become sentimental and attached to some unexpected things, so I wasn’t sure how this would go. I mentioned it to her for the first time on Sunday before nap, and she was actually very excited about getting rid of the crib. In fact, I almost wondered if she understood what I really meant by it. No more crib ever. Bye-bye, crib. Adios. But she still agreed that she was okay with the crib being taken down and removed from her room. After she woke up from nap, she said the same thing, so I asked The Husband if he’d mind going ahead and taking it down, which he did before the girls’ pre-dinner bath. The Little Sis stayed in her room and watched the dismantling process, acting as a very good helper by putting the hardware into the bag for The Husband. He finally got all of the parts disassembled and we started moving them out of the room, and I knew everything was going to be okay when she started jumping up and down where the crib was and said excitedly, “Yay! Yay! It’s open! It’s open!” We moved the futon to the far corner of her room, and she was very excited to sleep in her “new bed” last night. At some point we’ll get her a real bed, of course, though The Big Sis slept with the futon for a while before we got her a bed; I like that the futon is pretty low to the ground, just in case she rolls off. Knowing that this is our last child, and the last time taking down the crib, I think I’m supposed to feel sad or, at the very least, bittersweet about this transition. But I truly have no such emotions attached to this milestone. Yes, time continues to escape into some unseen vacuum that hovers around us at all times, but I have to admit that I find it a little exciting that she’s reached this point. If she embraces this change, then why shouldn’t I? You are currently browsing the And Baby B Makes Three! blog archives for July, 2014.